FINALLY! It's taken several tries, but I FINALLY get the appeal of Gaiman's writing. I was less than impressed with The Ocean at the End of the Lane and Neverwhere, but I fell in love with this collection of short fiction. I hadn't read anything of his other than novel-length books, so all of this was new to me, although some of it has been printed before. 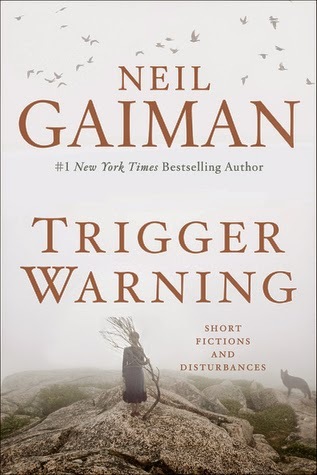 This totally lived up to my expectations of Gaiman as a teller of creepy tales. I even enjoyed the Dr. Who story, which I didn't expect as I'm not really a fan of fan-fiction. Obviously, this was done by an expert and I appreciated the way he added to canon without making any changes. Again, I feel like I finally get what all the Gaiman hype is about. These are certainly well-written, but I think the largest appeal lies in how disturbing and engrossing each of these stories are. Nothing here drags and even the stories intended for specific fandoms can be appreciated by all readers. I really appreciated the creep factor present in many of the stories ("Click-Clack the Rattlebag" is my favorite) and found delightful fantasy elements in the stories that aren't as frightening. This is a well-rounded collection with a bit of something for everyone, from fans of horror to fantasy to geekdoms. Some stories are scary, some are funny, and some are moving, but all move quickly and keep the reader engaged. My book club read this together, courtesy of Book Club Girls, and we all enjoyed it immensely despite having widely varying tastes in fiction. Thanks to Book Club Girl for providing us with a copy to read! This closes out our six month adventure with the Book Club Girl program. A huge thanks to Onalee and Harper Collins for the great opportunity and the wonderful books!